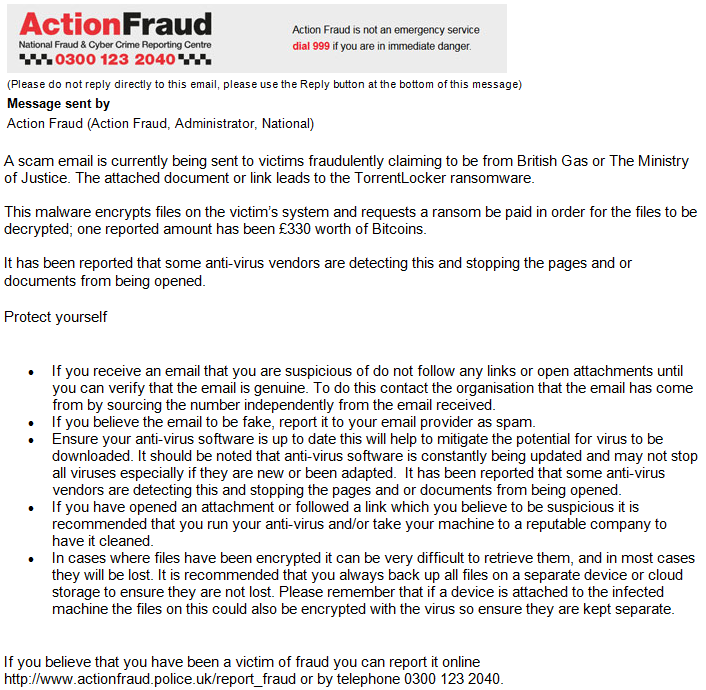 A scam email is currently being sent to victims fraudulently claiming to be from British Gas or The Ministry of Justice. The attached document or link leads to the TorrentLocker ransomware. There has been a rise in the number of thefts of catalytic convertors across the county recently. Favoured vehicles appear to be Mercedes Sprinters and Ford Rangers. There are alarms available to protect against this type of offence which cost around £400 with the cost of a new exhaust system being £3000. Please report any suspicious activity via 101 or a crime in progress always 999. Please find attached the January edition of the Farmwatch Bulletin. Please find attached the latest newsletter from the Marlborough Neighbourhood Policing Team. We have recently had a series of non-dwelling burglaries specifically targeting sports/social clubs and village halls. I have contacted a number directly but I am conscious there may be some I am unaware of or whose details I do not have. Please could you pass this information on to anyone you think appropriate. Our advice would be never to keep cash on a premises overnight and anything of any value to be locked away securely. If anyone requires security advice please let me know. 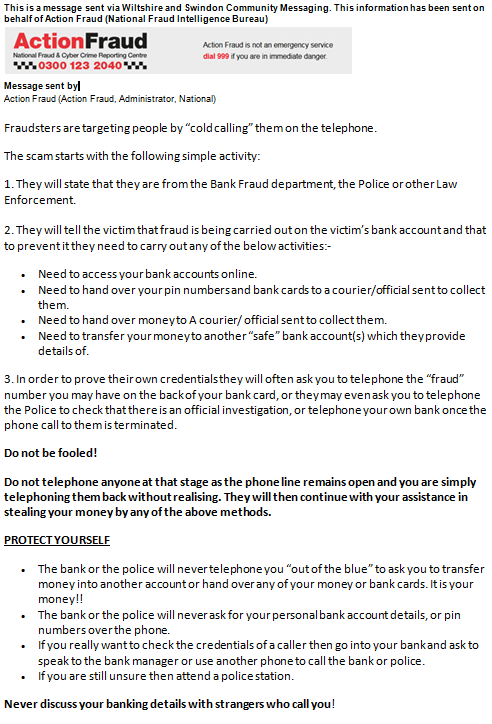 I have taken a report of a male cold calling posing as an antiques dealer. He has possibly been in the area in the last month and previously has posted business cards or flyers to nearby properties. If anyone has heard of anything in relation to this or has had someone call or a flyer put through their door please let me know. This is the time of year when we are filling up our heating oil tanks. There are some very unscrupulous persons who are taking the fuel from the tanks. It could be a van parked alongside a hedge seemingly broken down or just pulled over on the side of the road next to a garden. The side door of the vehicle may be open or there may be a small pipe running out of the van. The driver of the vehicle may even be sat in the seat while the pump is taking away the fuel. If you see anything that looks out of place please let us know. Please find attached the latest edition of the Rural Crime Team Farmwatch newsletter. Please find attached the August edition of the Farmwatch Bulletin from our rural crime team. Please find attached the July edition of the Farmwatch Bulletin. Please find attached the June edition of the Farmwatch Bulletin. A Crime awareness company allegedly called Storm have telephoned residents in the Baydon area. They offer to show some equipment that if someone needed help it would go straight through to the fire, police or ambulance. I am not aware of this company and find their tactics of ringing people and arranging home visits rather concerning. As I do not know anything about this company and cannot seem to find anything on the internet about them I am unable to comment about their authenticity. Please could you make others in our area aware of this company. I have asked some residents to contact the police should anyone from this company turn up in any of our villages so that we can send a unit out to speak with them and check persons and vehicles that they might be using. They have mentioned so far that they will be calling on persons in Baydon at 10:00Hrs tomorrow (03/03/2012). If they ask questions to see if you live on your own or your age or even if you will be in, be mindful of what information you give out. Distraction burglaries are not common but I do advice caution towards cold callers whether it be at the door or over the phone. I do not want to alarm you by this email but want you all to have as much information in regards to the above. Please pass on to others as you see fit. Please find attached the latest edition of the Farmwatch Bulletin. Please also note that there has been an attempt break on the High Street, Manton to the rear patio doors of a property. It looks like a screwdriver or similar could have been used to try and gain access. This could have occurred the last 10 days. Please be vigilant in reporting any suspicious persons in the area. Please find attached the latest surgeries poster for March 2011 . Please accept my personal apology for not being at the surgeries on Monday 7th of March, this was due to an administrative error on my part. Marlborough and Pewsey areas suffered several burglaries occurring at farm premises at West Overton, West Kennet, West Stowell, Alton Barnes and near Burbage. In each case farm buildings were entered and although in several locations items were moved around only in one was something actually taken - a quad bike. The quad bike was recovered by Police and returned to the owner. Some premises have previously fitted security devices which have recorded images of those responsible and enquiries are ongoing in respect of vehicles and identities of those involved. We request that owners of any similar properties consider any theft prevention measures they can reasonably take including the fitting of security devices and the marking of property with post codes or other identifiable marks. The series is under thescrutiny of the Priority Crime Team and will form part of the ongoing Police operation running in the area whereby operational services are being tasked to interrupt the activities of criminals moving through and operating within our area. The Neighbourhood Policing Teams, Rural Crime Team and the Area Response Teams are all part of this ongoing operation, with additional units being apprised as appropriate. Members of the public are asked to continue being vigilant at all times, especially during the hours of darkness into the small hours. Any suspicious activity should be noted and reported to the Police immediately, and registration numbers of vehicles or descriptions of suspicious persons being written down. The Officer collating all enquiies and information on the series locally will be PC 2377 Sarah Watts to whom all calls should be directed, or CRIMESTOPPERS as appropriate. Do you know how to contact your local police? Well PC Jonathan Mills has kindly sent in details on how to get in touch if you need to. Click on the icon here for details. If you have any questions or would like to add any comments regarding recent neighbourhood events to the website please email them to mail@chiltonfoliat.com and I will include them here on the website. Thanks, D.
Please find attached the latest copy of the neighbourhood police bulletin . Please distribute as you see fit. I would also like to make you aware that the bulletin will now be produced quarterly instead of monthly. In an emergency, when life is in danger or a crime in progress, dial 999. In a non-emergency dial the new number, 101. If you are deaf, hard of hearing or speech impaired, you can textphone on 18001 101.